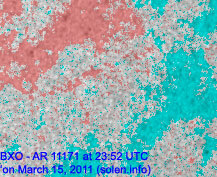 Last major update issued on March 17, 2011 at 05:10 UTC. 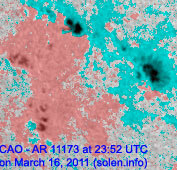 The geomagnetic field was very quiet on March 16. 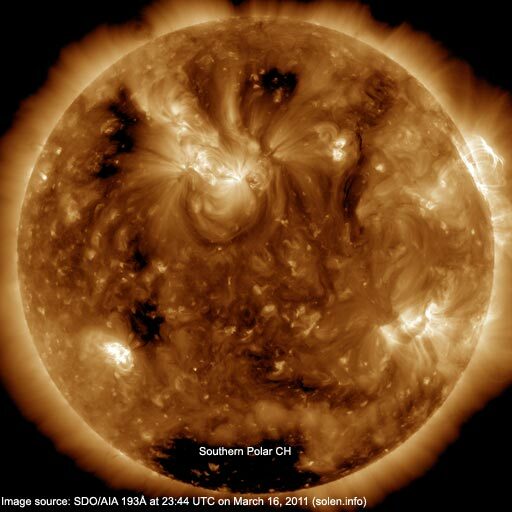 Solar wind speed ranged between 305-367 km/s. 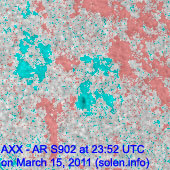 Solar flux measured at 17h UTC on 2.8 GHz was 93.8 (decreasing 17.1 over the last solar rotation. 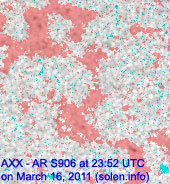 The measurements at both 20 and 23h UTC were enhanced by a long duration event). The planetary A index was 0 (STAR Ap - based on the mean of three hour interval ap indices: 0.5). Three hour interval K indices: 00000001 (planetary), 00000111 (Boulder). 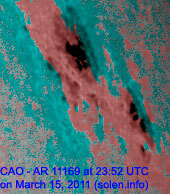 Region 11169 decayed slowly and will rotate out of view at the northwest limb today. C flares are possible. Flares: C1.3at 08:47, C1.4 at 13:51 and a very long duration C3.7 event peaking at 20:34 UTC. 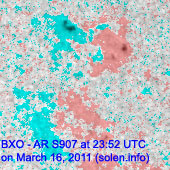 The latter event was associated with a bright CME off the northwest limb. 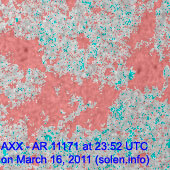 New region 11173 emerged in the southeast quadrant on March 15 and was numbered the next day by NOAA/SWPC. 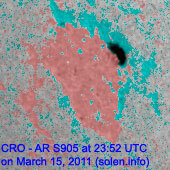 The region developed slowly on March 16. 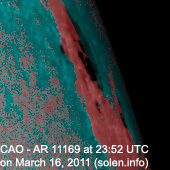 March 14-16: No obviously Earth directed CMEs were observed in LASCO and STEREO imagery. 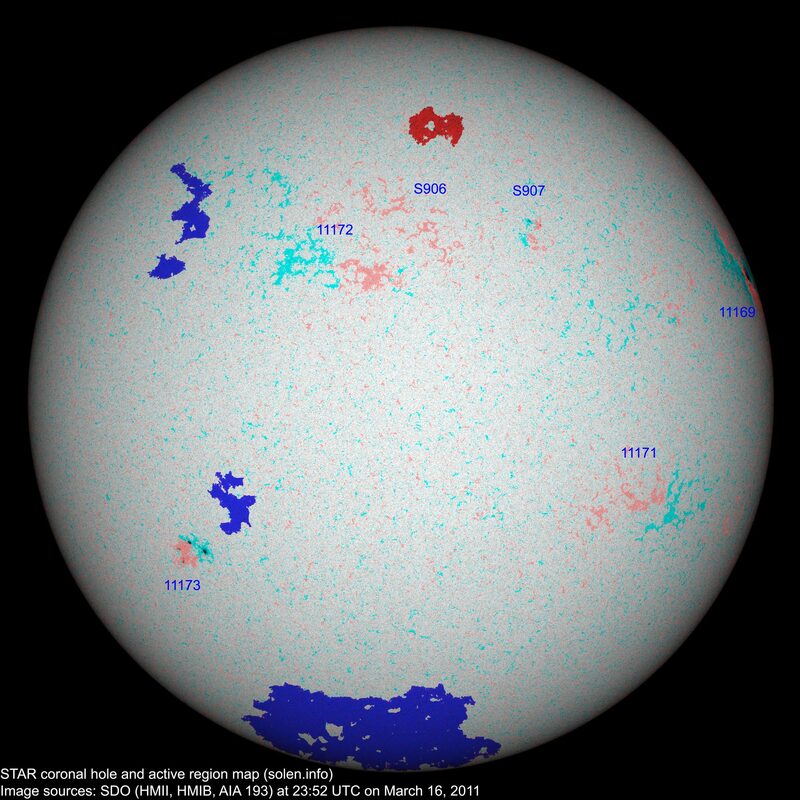 The geomagnetic field is expected to be mostly quiet on March 17-20.